Click here for High Resolution PDF brochure.. 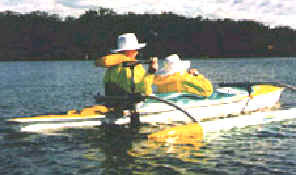 The craft was designed for people who do not wish to combine pleasures of silently exploring secluded waterways with rigorous exercise of paddling. Another objectives in developing this craft was to be able to transport it on top of the car, not needing trailer and being able to be handled by one person or two people most. 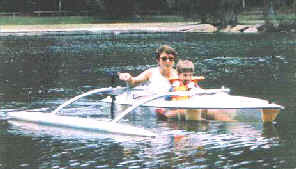 The craft is easy to control when on water and then easy to pull apart for transportation and storage. Some of the models and configurations available are:. Hull 2.4m long. Material can be acrylic or in fiberglass. Carrying capacity - nominal up to 75kg. Offers joy ride for children. 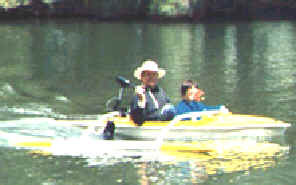 Running time one hour at cruising speed, motor MinKota Endura 30. Two 2.4m hulls joined like a catamaran. Material in acrylic or fiberglass. Carrying capacity each hull - 75kg. Offers joy ride for two young adults. Each hull has one small battery, mounted in the front of each hull. 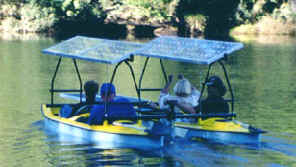 Options � splash covers, solar panels, table, larger motor. Carrying capacity 3.3m up to 120 Kg. Offers joy ride for adults. Maximum speed 6 km/hr, cruising speed about 5km/hr. Can have a car battery in the back and a small battery in the front. Options � splash cover, solar panels, window in the bottom, larger motor. Hull 3m or 3.3m long. Material only in fiberglass. Carrying capacity 3m up to 85Kg, 3.3m up to 120 Kg. 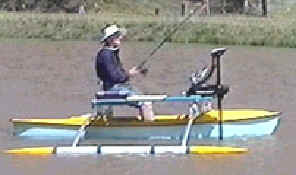 Ideal for fishing. Maximum speed 6km/hr, cruising speed about 5km/hr. Battery -large is mounted in the front below the dashboard. Running time three hours while cruising, motor MinKota Riptide RT40/S. Hull 4m long.� Material only in fiberglass. Carrying capacity - up to175kg. Ideal for joy ride or cruising for two. Maximum speed 6.5km/hr, cruising speed about 5km/hr. Running time four hours while cruising, motor MinKota Riptide RT50/S. Options � splash covers, solar panels, side table, instrumentation. Capacity 175 Kg each hull. Ideal for a group of friends. Maximum speed 6.5 km/hr, cruising speed about 4.5km/hr. Two large batteries in the back. Instrument for current/voltage monitoring. 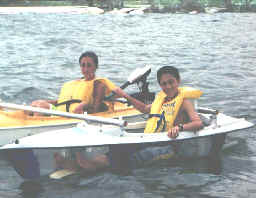 Running time about five hours while cruising, motor MinKota Riptide 74/S. Options � splash covers, solar panels, table between the hulls, instrument. Hull 4.9m long. Material Kevlar & carbon fiber. Maximum speed 8km/hr, cruising speed about 6km/hr. Two large batteries are mounted below the mid deck for easy access. Running time five hours at cruising speed, motor MinKota Riptide 74/S. Options � splash cover, solar panels, side table, instrumentation.